Congressman Walter Jones Jr., who served in Congress and the state legislature for over 34 years, died Sunday on his 76th birthday. The long-serving Republican was a fiscal hawk who repeatedly spoke out against the war in Afghanistan. “I am deeply saddened by the passing of a long time leader, proud North Carolinian, a devoted family man of deep faith, and my friend of over forty years- Congressman Walter B. Jones, Jr.
“Congressman Jones represented the best of North Carolina politics. He understood that being a leader meant often putting political allegiances aside in order to bring people together around important work. 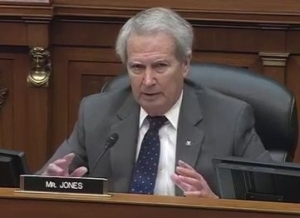 He was a proud representative of eastern North Carolina, and the residents of North Carolina’s Third Congressional District are better off thanks to the lifelong service and dedication of Walter Jones. “To serve alongside Walter Jones was a great honor and privilege. Let us honor Walter Jones’ service to our country and the profound leadership he offered eastern North Carolina. I will miss his humility, intellect, and unwavering love of his community. My prayers are with Congressman Walter Jones family, staff and the people of the 3rd Congressional District. “Whether serving in Raleigh or DC, Jones’ first priority was always eastern NC.